Milwaukee-Eight® Engine: With the Milwaukee-Eight® 107 engine, the Sport Glide™ has enough power and torque to go almost anywhere quickly. Rigid mounting and internal counterbalancing allows for a smooth ride without giving up the Harley feel that riders know and love. All-New Softail® Frame: The Sport Glide™ motorcycle rides on the completely redesigned Softail® frame which makes for a lightweight, nimble ride you have to feel to believe. 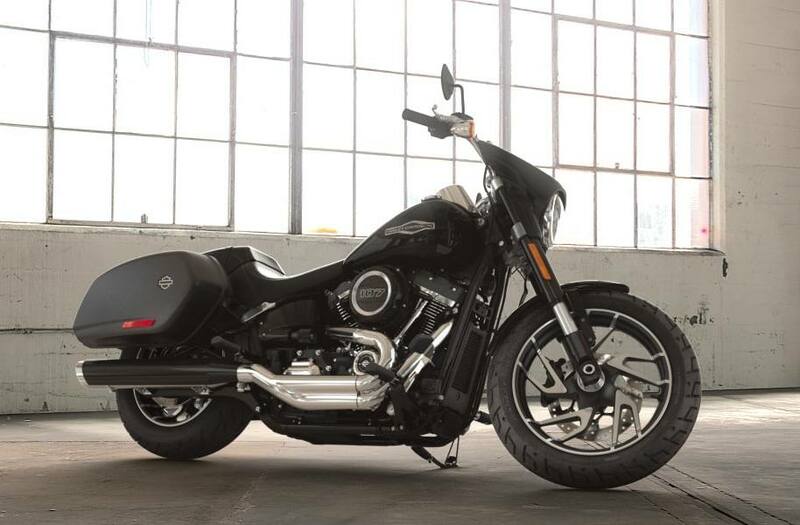 Aggressive Styling: A blacked-out Milwaukee-Eight® engine, all-new aggressive “Mantis” black and silver cast wheels, and black mufflers give the Sport Glide™ a stealthy style. Modern Technologies: The Sport Glide™ has a slew of modern amenities, including a LED forward-lighting system, USB port and a keyless ignition. **Vehicle shown may vary visually by market and may differ from vehicles manufactured and delivered. See your dealer for details. All comparisons made are between original equipment 2017 and 2018 models. Recommended 91 octane or higher fuel (R+M)/2. Fuel Economy estimated from fuel economy tests on a sample motorcycle from the corresponding family conducted by Harley-Davidson under ideal laboratory conditions. Not all motorcycle models undergo fuel economy testing. Fuel economy and mileage may vary among motorcycle models within a family. Your mileage may vary depending on your personal riding habits, weather conditions, trip length, vehicle condition and vehicle configuration and other conditions. Break-in mileage may vary. Engine torque values shown are nominal. Performance may vary by country and region. Standard and optional fuel systems may vary by country. Standard and optional wheels may vary by country and region. North America security system includes immobilizer; outside North America the security system includes immobilizer and siren. Seat Height measurement reflects 180 lb. (81.7 kg) operator weight.